Here is our tree. We decorated it differently this year. We didn't use all the Story Book ornaments. We went form the bigger "Mickey Head"ones. I like it! 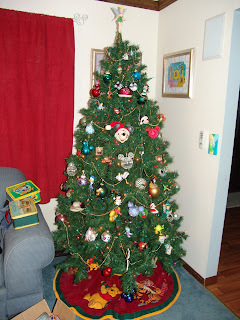 I like the tree skirt and of course the mickey decor. Who knew you liked disney??? I like the tree skirt too! Very pretty tree! We're getting ours hopefully today...if the rain quits!